When I saw the LivingSocial offer for Manao Thai Restaurant, I was very excited (more Thai food!) so I checked the location, and immediately purchased it without checking the menu. I figured, they probably have Pad Thai … most places do. But then, when I checked the menu when we got ready to visit Manao, and noticed that they didn’t have Pad Thai on the menu, I was a little worried … uh oh! 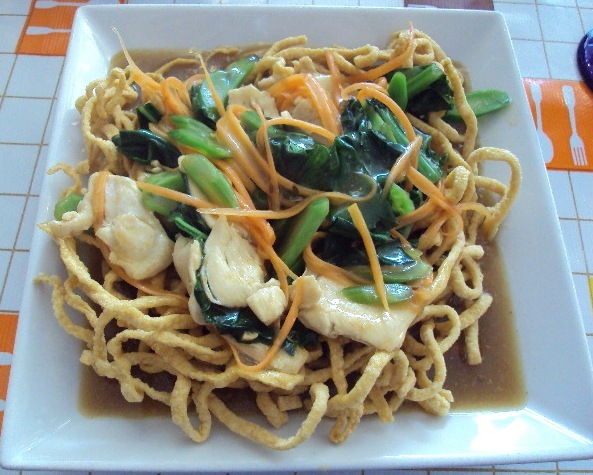 I had won my husband over on Thai food based on the flavorful dish, but, what was he going to eat when there was no Pad Thai on the menu? 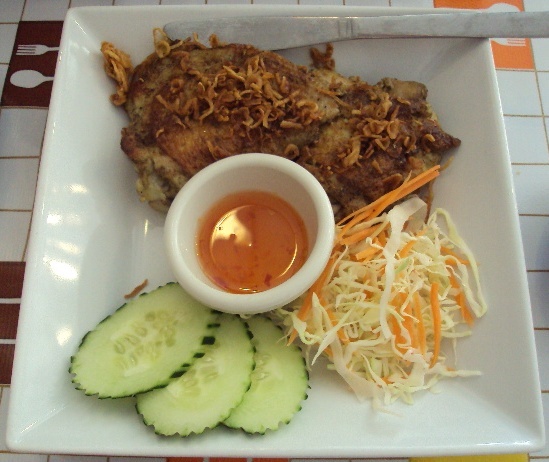 Order: I ordered the Mii Krob Lad Na with Chicken ($8.50) while my husband ordered the Haw Mok Kai ($9.50). We shared an order of Spring Rolls ($4.50) for an appetizer. The atmosphere reminds me very much of a “ma & pa” type of place with it’s simple, home-y decor. Nothing really overly stylish or glamorous, this place looked like a typical kitchen table at dinner time in the 60s, complete with retro-style vinyl tablecloths. The place was empty when we arrived, but as we waited for our lunch, more diners arrived. I know that we should not judge a book by its cover, but based upon this setting, I wasn’t really expecting a whole lot from Manao. The Spring Rolls seemed to further support my low expectations, because, while they were tasty, they were kind of boring. Then I tasted my Thai Iced Tea! YUM! Easily the best Thai Iced tea I’ve had since we moved to the Pacific Northwest. You might be thinking … how can one mess up iced tea? But, trust me, I’ve tasted some not so great Thai Iced Tea, some average Thai Iced Tea, as well as some good Thai Iced Tea. But this stuff – this is the way Thai Iced Tea should always be. The deliciousness of the iced tea raised my expectations, and I had high hopes again for what was to come with the entrees. The Mii Krob Lad Na … amazing. This is so good – good enough that if I find this on another Thai restaurant’s menu in the future I will order it. 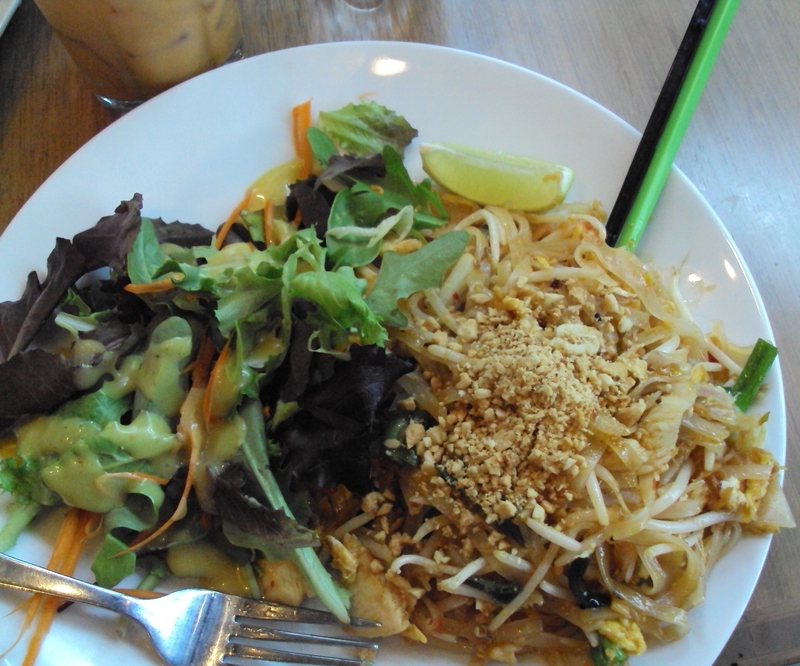 I don’t know that I like it as well as I like Pad Thai, but, I certainly found it to be incredibly filling and very satisfying, definitely the kind of meal that you would want to sit down to if you were ravenous, because it is so good that you’ll want to finish it! Sadly, I couldn’t finish it, but not because I didn’t want to. I was just too full! The gravy/sauce is rich and savory, and very flavorful. The crunchy noodles soak up the sauce and become somewhat soft – and the softened/soaked crunchy noodle has such a delightful texture to it. It’s one of those very satisfying kind of experiences with both taste and texture – like soaking up a delicious stew gravy with crusty bread. This is Thai comfort food. The broccoli and carrots add a nice flavor as does the chicken, but really, the real stars of this dish are the gravy and noodles. My husband’s Haw Mok Kai seemed promising based on the menu description of the dish: seared chicken thighs that had been marinated in herbs and served with a chili sauce. Unfortunately, this dish was just alright. The chicken was a little on the dry side and not really flavorful, and its real redemption came from the sweet chili sauce which I found very tasty, and seemed to add a much needed flavor boost to the chicken. My husband found himself wishing he had ordered the Mii Krob Lad Na. I don’t think there are enough fine words that I could come up with to describe the Mii Krob Lad Na. I really, really loved this dish. I am getting hungry now, just thinking about how good it was. I had not expected to enjoy it as much as I did! I do wish that my husband’s experience was as favorable as mine, his enjoyment of the meal would have made the experience even better. I left very satisfied … him, not so much. But I don’t think that will stop us from visiting again in the future, because he knows now to order the Mii Krob Lad Na! Shortly after redeeming our first LivingSocial voucher for Kesone Thai Lao Bistro, I got an opportunity to purchase another one. Since both my husband and I enjoyed the place, I jumped at this opportunity … I mean, hey, it’s Thai food! This time around, I definitely wanted Pad Thai, mostly because I knew my husband had planned on amplifying the heat on his Pad Thai plate, and while I do enjoy the spicy, I wanted to enjoy it a little less spicy than he desired. With this visit, I noticed that again, our appetizers were brought out at the same time as our entrees. Again, this is not a complaint, because the food was brought out so quickly it wasn’t as if we were waiting very long at all for anything. This time, we selected the appetizer sampler plate ($9), which included three different appetizers – two summer rolls, six golden bags and two chicken sa-tay. I found the chicken sa-tay to be somewhat dry, but the golden bags were crispy and delicious, and I loved the fresh crunch of the summer rolls. I have been wanting a good summer roll for a while now – I mean, sure, I love the crispy, golden-fried deliciousness of a spring roll, but, there is something about that fresh, minty taste of a summer roll that really brightens the palate. The Pad Thai was just as delicious as I remember. The chicken was cooked nicely – a little dry, perhaps, but not to the point of being overly chewy. 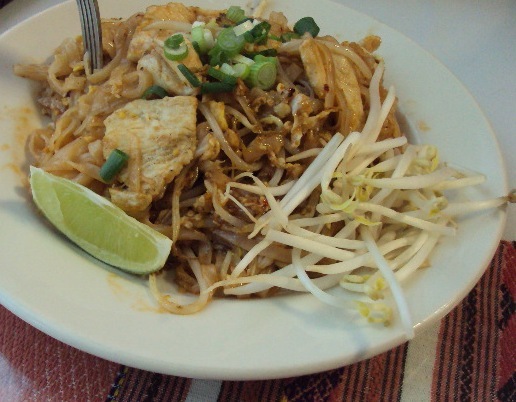 And really, when it comes to Pad Thai, it really is less about the chicken for me and more about the noodles. I love the delicious rice noodles that have been coated with the spicy sauce, the crunchy texture from the bean sprouts and the crushed peanuts… Pad Thai really is a culinary delight. 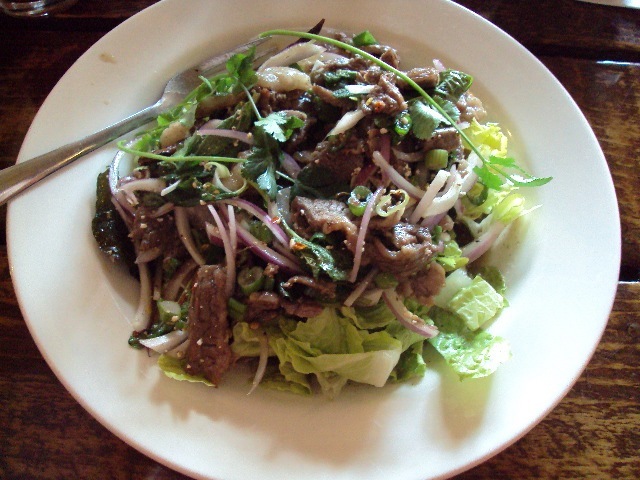 Will we be returning to Kesone Thai Lao Bistro – YOU BET! Photo from Grilled Cheese Grill website, click on the pic to go there. We’ve actually been to Grilled Cheese Grill a couple of times since my last review. What can I say, I love a good grilled cheese sandwich, and I really like how the folks at Grilled Cheese Grill take a good thing (the classic grilled cheese) and push the envelope with it! Case and point would be my newest favorite sandwiches from GCG: The Jalapeño Popper ($5.75)! Oh. My. Goodness. This sandwich is GOOD! Spicy, yes. Be ready with something refreshing to cool the palate. The sandwich is made with freshly roasted jalapeños (not the jarred stuff), colby jack cheese, cream cheese and corn tortilla chips sandwiched between two pieces of sourdough bread and grilled to golden perfection. I ordered mine with bacon (add $1.75), because, what doesn’t taste better with bacon, right? This sandwich is absolutely incredible. I think that the GCG prepares the jalapeños themselves, because I didn’t notice any of the seeds or membranes of the pepper in my sandwich. This helped to reduce the heat a little in my sandwich, and thus allowed some of the fruit notes of the pepper to emerge. It was still HOT, make no mistake, but it wasn’t too hot. The colby jack is melted and gives a nice, chewy texture to the sandwich. The cream cheese is a little on the light side, but, I don’t think more cream cheese would have made this a better sandwich. As it was, the cream cheese added a little bit of sweetness and curbed the heat of the jalapeño just enough. The tortilla chips did not add any real crunch to the sandwich (although the crispy, grilled outer crust of the sandwich certainly did!) but it did add a nice dimension of flavor, and really added to that “popper” kind of taste as promised with the name of the sandwich. The bacon … well, let’s just say that without the bacon, this sandwich was delicious. But WITH the bacon, this sandwich becomes insanely irresistible, absolutely memorable, and completely crave-able. I really, really liked this sandwich, and I’ll definitely order it again sometime. On another visit, I ordered the Southsider ($5.75), which is artichoke hearts, sundried tomatoes, and mushrooms with mozzarella on sourdough bread. This sandwich is also really outstanding, tasting a bit like a gourmet pizza in sandwich form. The artichoke hearts were pickled and added a tangy flavor to the sandwich from the pickling, while the sundried tomatoes gave this a delicious base flavor … although, if I had been putting the sandwich together myself, I think I would have added more tomatoes (but then, I love sundried tomatoes). The mushrooms I think would have been a little better if they were thicker cut, but they still added a nice, earthy flavor and pleasing texture to the sandwich. This sandwich was very filling and satisfying, and one I’d recommend if you’re really hungry. This one filled me up. Will we be visiting Grilled Cheese Grill again – ABSOLUTELY! It’s become my favorite cart in Portland … although, I admit that I’ve not visited many carts YET! I’ll be reviewing a couple of “revisits” again soon … specifically, the Burger Bungalow and Soi 9 Thai Eatery.